Loved the story of Juliet and Roman. It was intriguing, exciting and sad at times but keeps you wanting to read more (as with all Autumn's books). Can't wait for the next novel she puts out! 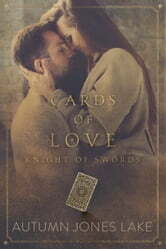 Knight of Swords was my first Autumn Jones Lake novel and I loved it. This insta-love young adult novel had me hooked from page one right until the end. The chemistry between Roman and Juliet was so intense, even at that young age you just knew they were meant to be together. These characters were flawed yet well-developed and their story will evoke a range of emotions from you. Both from a less than desirable background, these two loved each other with a single minded focus and inspite of any ups and downs that focus never shifted. Apart from romance, there was some drama and angst in the story which all helped to keep you glued to the pages. I absolutely loved this page-turner. It was a great introduction to this author's work and has left me curious about her other books. This installation in the Cards of Love series was a great read and I would recommend it to all lovers of young adult romance. Autumn has done it again. So easy to love her characters and get drawn into their lives Once you start the first chapter you can’t put it down until it’s done!!! "I think I've been waiting for you." The origin story of Vapor and Juliette is touching,heartbreaking and written with such compassion. The characters both have hard childhood traumas to overcome and they mange to do this by supporting and loving each other. Autumn always brings her stories to life that you can actually feel that you are walking inside the story. Love seeing Dex and Murphy from LOKI in the book and can’t wait for Dex to have his own origin story. Would love to read more about Vapor and Juliet in the future.